How about a little red sewing machine to guide shoppers? A friend contacted SubScribe yesterday to ask about the Telegraph's web coverage of the Dhaka factory collapse, asking why it had focused on Primark and was there a vendetta against the company. Had someone done something to upset the editor? For a journalist, it seemed natural that the Telegraph had emphasised the relevance of the disaster to a British audience by pointing up the link with such a successful business. But it was equally interesting to note that brands such as Benetton, Mango and Monsoon also had connections with the building. So how is the shopper supposed to know? That thought is what prompted this non-media post. A T-shirt for less than the price of half a dozen eggs? How can that be possible? A Christmas turkey that costs more than your party dress? That’s crazy! An entire school uniform for less than a couple of lamb chops? Surely that can’t be right? Yes, it’s possible; yes, it’s crazy; yes, it’s true – and no, it isn’t right. It’s possible because we have outlawed battery hens, but we have done little or nothing to outlaw battery women. We pat ourselves on the back as we reach for the free-range eggs, turning up our noses at those produced by caged birds; we wince at the price as we pick up our bronze bird for the Christmas table but pay up, and we check for the tractor symbol on our pack of Welsh lamb chump chops. We’re good, right-on people, concerned for animal welfare. 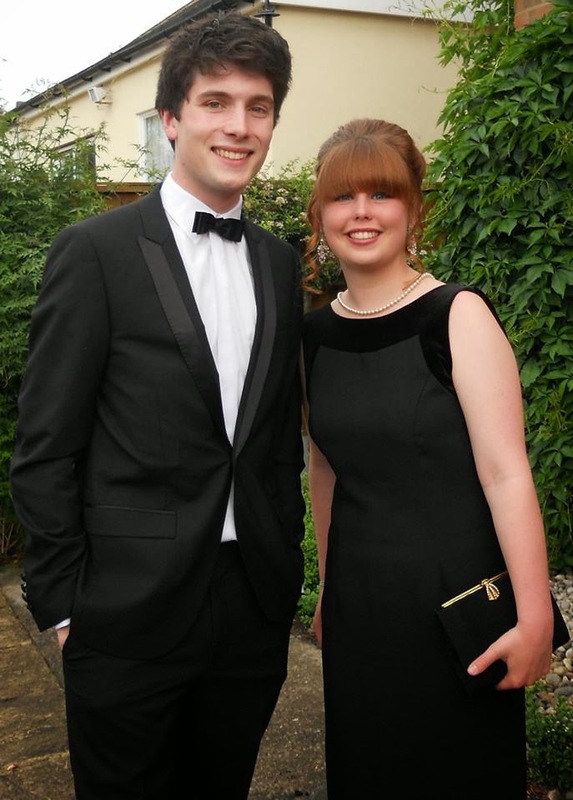 Then we jump in our cars and head for Westfield or Lakeside or the Trafford Centre, leaving our consciences behind. 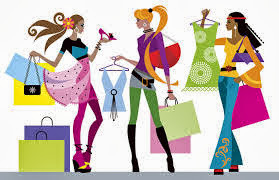 We roar around Primark or Matalan, filling our net baskets to overflowing with jeans, shirts, dresses, jumpers, nighties, even bed linen and towels that we don’t need because we can’t resist the ‘bargains’. We tell ourselves that these things are so cheap that it won’t matter if they don’t fit or match the wallpaper – and then we find at the checkout that we’ve spent a hundred and fifty quid on a load of toot that will clog our cupboards, unworn, until we have a massive clearout and take most of it to the charity shop with the tags still on. Been there, done that, got the T-shirt ­ - the £1.50 sole survivor of the shopping trip. Well that was a real bargain wasn’t it? So if this £1.50 T-shirt has ended up costing me £150 (plus petrol), how much did it cost others further down the supply chain? The retailer has to build, buy or rent his premises, light the shop, pay the staff, pay taxes and pay accountants to minimise them. To do that, he needs to turn a good profit on his merchandise, so the chances are he won’t have paid more than 50p for that T-shirt. As a big player, our retailer will probably have negotiated directly with the manufacturer. Let’s move on to him. The manufacturer is based on the Indian sub-continent, where the raw materials for textile making are abundant and labour is cheap. The seamstress who made my T-shirt is required to produce dozens, scores, possibly even hundreds in a long working day. For this she is paid about 75p. On Tuesday someone noticed that there were cracks in the factory where she works. The safety authorities came out and inspected it and ordered the building to be evacuated and closed. So our seamstress had a day off? No. Her bosses looked at the building, declared it safe and ordered the women back to work. Fearing the sack, they went, taking their children with them – to be looked after in a crèche on another floor. Within hours the building had collapsed. There were 2,000 working inside at the time. A thousand have been treated in hospital, more than 350 are known to have died. That leaves about 600 people crying in the rubble or crushed and undiscovered. It’s a high price for a T-shirt. The Rana Plaza near Dhaka is one of more than 5,000 buildings in Bangladesh that house a clutch of clothing factories to supply the West. Production costs are kept to the bare minimum to keep an edge over rivals across Asia – China, Vietnam, India, Pakistan, Thailand – and factory owners there (and elsewhere) show scant regard for the safety or security of their workers. In September last year about 280 people died when fire swept through a factory in Karachi, Pakistan, that had been certified as safe by Western observers only two weeks before. Last November, more than a hundred were killed in a blaze in another Dhaka garment factory building; survivors staged a protest two weeks later and the Prime Minister urged employers to pay greater attention to safety and to increase workers’ wages – but was anybody listening? Bangladeshi textile exports to the West are worth about £12.5bn a year and the industry employs about four million – 80 per cent of them women. 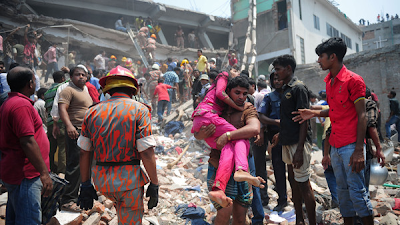 The Rana Plaza building has supplied Primark, Matalan, Benetton, Monsoon and Bonmarche. Tazreen Fashions, site of the November fire, made clothes for C&A and Wal-Mart (Asda). The Baldia factory in Karachi supplied the German discount chain KiK. Gap, Zara and H&M all buy clothes from Bangladesh. We have responded to television campaigns about sustainable fish, factory farming, even turkey Twizzlers and adjusted our shopping habits. But countless television documentaries about the conditions in sweatshops making clothing, toy and electronics seem to have no impact on our behaviour – is it because we’re all softies about animal welfare in our own society, yet don’t give a fig for human welfare a few thousand miles away? Western retailers are eager both to distance themselves from suppliers who exploit and endanger their workers, and to be seen to embrace inspection regimes and ethical sourcing programmes. But it isn’t enough. They need to bring greater pressure to bear on the manufacturers, to become more closely involved in the production of the clothes they sell so that they can proclaim loud and proud that they know everything about the factories they buy from, just as the supermarkets do with the farms that produce our food. It is no use shoppers boycotting Matalan or anything with ‘Made in Bangladesh’ in it; that will only harm the workers. And paying a little more may salve the conscience, but do little else: the £1.50 Primark T-shirt could well have been made by the woman next to the one sewing the £30 Benetton trousers or the £90 Monsoon maxi dress. Without scouring the ethical websites, we have no way of knowing whether our upmarket little number really was produced by women working in decent surroundings for a decent wage. If our high street shops got together to produce a sewing machine symbol to guarantee the source of our clothes, just as the supermarkets do with the tractor for our food, everyone would benefit. Workers would be treated properly, customers would know what they were buying and stores would gain in reputation. Prices may rise to a more sensible level, but market forces should prevent them rocketing. Some stores would decline to join the scheme, but we would know that from the absence of the little red sewing machine. People could still buy cheap clothes as they do cheap frozen chicken. But that would be a matter for their purses and their consciences. 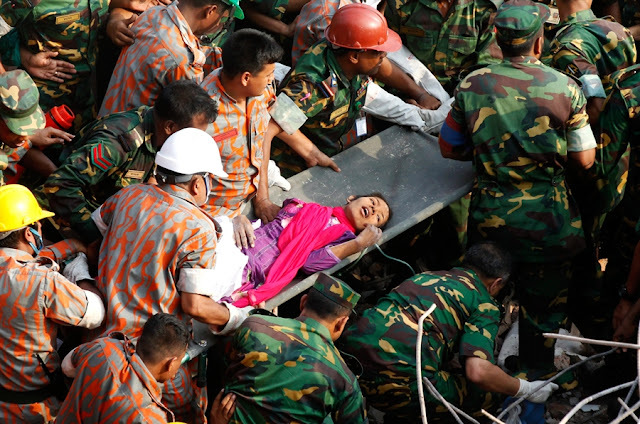 The death toll from the Bangladesh factory collapse last week has now passed 400. There is scant hope that anyone else will be rescued from the rubble. As the bodies have been buried, so victims' families, survivors and garment workers from other factories have taken to the streets of Dhaka not to weep and wail, but to assert their right to better treatment. The people of Bangladesh are not supine starvelings begging for the world's pity. They want to work, to do so for a decent wage in decent conditions, and not to have their lives endangered by greedy and incompetent governments, employers or customers. It isn't a lot to ask. SubScribe pitched its tuppence into the muddy fountain last week with the suggestion that retailers should take a pro-active role in monitoring the conditions under which their merchandise is manufactured and that goods coming from factories that are properly run should be entitled to attach a little red sewing machine symbol to their labels. The idea was not intended as a solution to all the problems of sweatshops all over the world. It was meant as a device to inform shoppers as they riffle through the racks. The idea was born from the disclosure that not only Primark and Matalan bought from the three factories in Bangladesh and Pakistan that have killed nearly a thousand workers in the past six months. Gap, Monsoon, Benetton were also among the brands that have been sourcing clothes from the death-plants. Common sense might tell people that if they buy a T-shirt for a quid or two, it probably hasn't been made in a beautifully lit open-plan building with water coolers and potted palms. But if you pay £30 or £90 for your new shirt or dress, it might be reasonable to assume that it wasn't thrown together in a sweatshop. And so the little red sewing machine was devised not as a means of punishing Primark, but as a reward for those shops that went out of their way to make sure that they did not profit from others' suffering. The suggestion aroused much interest - "Great idea!" "Is there a campaign?" "How can we make this work?" and the most gratifying demand from the fashionista Luella Bartley "Little red sewing machine!!!! Now!!!" @laurenlaverne @gameoldgirl little red sewing machine!!!!! now!!!! The enthusiasm was balanced by scepticism from experts who politely pointed out that there were already labelling systems, that there were inspection regimes, that retailers had already signed up to International Labour Organisation and Ethical Trading Initiative standards. But those systems, those conventions aren't doing the job are they? The workers are still being exploited - and so are the shoppers. 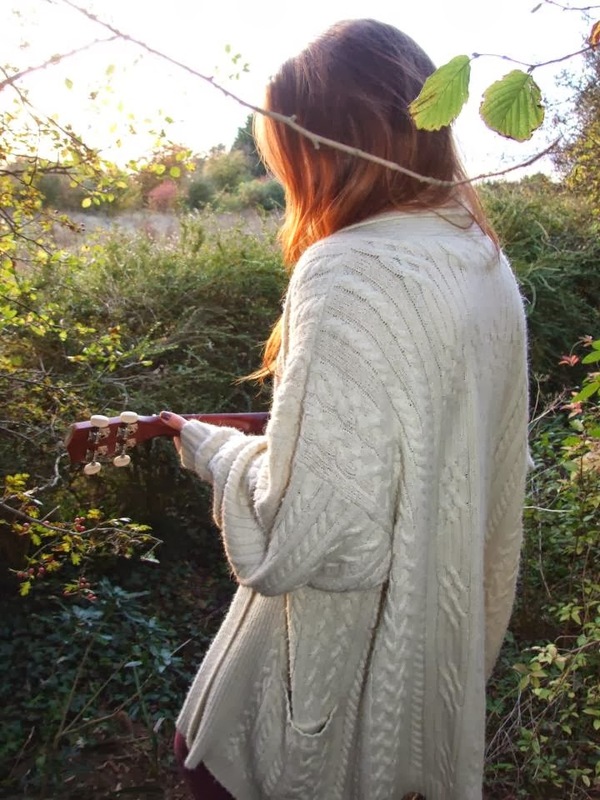 Fairtrade (well actually Traidcraft for clothes) seems to be the only brand where we can be absolutely sure that the vendor has proper contact with the producer - and that is hardly mainstream High Street fashion. "This company did not respond to our request for information, and makes no information available on its website. It is therefore safe to assume the worst - that it has no engagement with ethical trading at all." The first sentence is factual, the second preposterous. It is safe to assume the worst because a company declines to engage with a lobby group? Surely 'Consumers may draw their own conclusions' would have been fairer? We all want to know that the food we are buying is safe and this only comes from knowing where the raw ingredients come from and the standards to which they are produced, which is why all suppliers in the Red Tractor food chain are inspected and certified by an independent professional body." Naturally it is easier to monitor UK farm production than to check up on factories thousands of miles away, but it should not be beyond the wit of mankind to pull this off. AFS is not a fat quango, but a small organisation set up by farmers, growers and retailers. Associated British Foods, the owners of Primark, claims to have extensive systems in place to make sure that its food products are of top quality. It should be able to do the same for its clothing. Primark said this week that it carried out annual inspections of its supplier's second-floor factory in the Rana Plaza building, but did not check on the building itself. So its inspection system was so thorough that it was unaware that the owners had permission to build a five-storey building but had bunged another three on top, almost doubling the stress on the foundations and structure? Attacking Primark is not the answer. 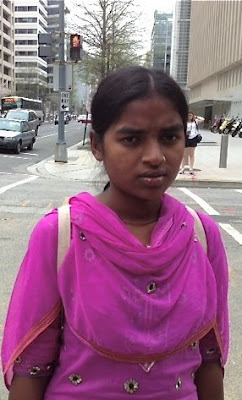 Boycotting Primark or dresses made in Bangladesh will do no-one any good. When a business is put under financial stress, it is always the workers who pay the price - thousands and thousands in Asia have lost their jobs since the financial crisis in the West reduced demand in the shops and thence for clothes from Bangladesh. The pressure needs to be applied on Dhaka, whose successive government policies created the sweatshop garment industry that accounts for 80 per cent of its exports. The industry has been encouraged to expand in special Export Processing Zones (make our enterprise areas sound positively attractive) to which foreign business are welcomed and from which trade unions are banned. Workers must be allowed to have their voice and the West's retailing giants - the Wal-Marts, the Loblaws, the ABFs, and the Sir Philip Greens - should make sure they have it. The Bangladeshis are perfectly capable of fighting their own battles if they are allowed to elect representatives to put their case in a proper forum without having to resort to the desperation of unrest and even violence. The big prize requires patience, negotiations and understanding at high levels. It will not be reached quickly. The smaller prize - the little red sewing machine - is more attainable because all it needs is for a group of like-minded industry experts to get together and to set up their own set of standards and their own inspection system. They don't need to look at every factory in the world, just those that supply retailers who want their ethical bona fides recognised. No shop or chain would be obliged to join in; if Matalan or J.C. Penney - or Sachs, Fifth Avenue - do not want to make the commitment to making their own checks on their producers, that is their prerogative. But they might find that shoppers do look out for the symbol that reassures them they aren't unwittingly perpetuating slave labour and join the club. We can only hope. If you would like to support this idea, please speak up. One way is to tweet, using the hashtag #littleredsewingmachine. And we might just make a difference. Reshma Akhter is carried from the wreckage with no broken bones. Great jubilation today over the rescue of a woman alive after 17 days in the rubble of the Rana Plaza building in Bangladesh. Naturally tomorrow's papers will focus on this 'miracle'. Reshma Akhter, an 18-year-old seamstress, was pulled from what was once the second floor of the factory building, apparently uninjured. She was well enough to describe how she had hit the wreckage with sticks and rocks to draw attention, but was beginning to despair. 'I never thought I'd see daylight again' will doubtless be the headline in more than a few places. Just as I am doing here, papers will give second billing to the dreadful fact that the Dhaka death toll has gone up by a hundred every day this week and is well past a thousand. Nor should we forget that a further eight workers died in another factory fire yesterday. The Rana Plaza disaster is now the world's deadliest industrial catastrophe since the Bhopal gas leak in India killed nearly 4,000 people in 1984. The collapse of the eight-storey building has captured media attention from the first moments, even when the death toll was 'only' 87. The disclosure that workers had been ordered to their machines, even though the building had been declared unsafe because of cracks discovered the day before, made it an even greater outrage than two previous disasters that had, at that point, claimed more lives. Journalists are used to dealing with high body counts in Asia. Industrial conditions do not by any stretch of the imagination meet Western standards. We are appalled by Chinese mining disasters and Indian rail tragedies, yet we are inured by their frequency - and by the comfort of knowing 'it's nothing to do with us'. We might pause for a moment on bonfire night to think of the children who have lost limbs in firework factory disasters - and then go and pour ourselves another glass or light the toddler's sparkler. We were brought up short last year with the spate of suicides at the Foxconn factory in China; too many of us own Apple products not to realise this was rather too close to home to brush off. But do you remember how many people killed themselves and what the core problems were? No? It's too easy to forget. Rana Plaza has made us think more carefully. It may be a five-minute burst of conscience, but something tells me this may be the moment that serious consideration of ethical shopping reaches beyond the realms of the bearded sandal-wearing veggie hippies and into the mainstream. Shoppers want to support ethical traders, but everyone in the fashion industry says it is too complex, that it is almost impossible to follow the manufacturing chain. How can you unravel the spider's web woven by the factories where the clothes are made, the shippers, the farmers who grow the cotton, the people who make the buttons? It's not like checking that pigs are being fed decent swill or that chickens aren't penned up in batteries. Or so I've been told. Well maybe it isn't simple, but that doesn't mean we shouldn't try. We have to find a way first to convince high street retailers - and not just the specialist cottage industry businesses - to make the effort to get fully involved in monitoring their suppliers. Yes it's hard to check up on factories thousands of miles away in countries where bribery and corruption rules, where certification can't be trusted and where codes and signals thwart independent inspectors. It seems that when the musack changes, overseers don white coats and goggles and take over on the production line from the children being ushered out of the back door. 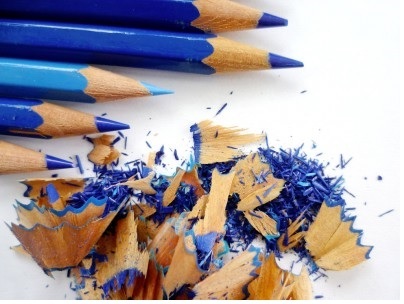 If the lighting suddenly become brighter, office staff dig out one of several sets of 'official' papers so that they have the 'right' audit for the 'right' buyer. If you are making millions of pounds from your sales, if your profits are soaring by 20% year on year, you need to invest some of that money into bringing a halt to such ruses and taking action yourself and not rely on middle men. Associated British Foods, which seems able to monitor suppliers in its food business, needs to get over to the sub-continent and start paying proper attention to the clothing side - Primark - that is the major source of its growing profits. And so do other retailers. There's no good going in with a big stick and threatening to source shirts and jeans elsewhere. They need to negotiate, to help the factory owners to understand how everyone could and would benefit if they cleaned up their act. And they need to tell their customers what they are doing. There's no use being coy. We are grown up enough to realise there's no instant solution, that conditions won't change overnight. There is a natural fear among brands that if they admit that they source goods from sweatshops or places where child labour is rife, they will be exposed on Panorama or by some intrepid print journalist and be ruined. 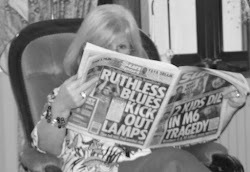 So the media have to be responsible, too, and look for progress and what is good, not simply at wide-eyed children who make a good photograph - and who might starve if they were forbidden to work. People in the West who care about the people who produce their food, clothes, toys, iPads must realise that boycotts will hurt only the workers at the bottom of the production line. That a little progress here and a bit more there is to be encouraged and not sniffed at as inadequate. But the Government also needs to engage fully and bring pressure to bear on fellow governments, to offer incentives to drive out corruption. It's a tough task, especially when you consider that at least 10 per cent of Bangladesh's 300 MPs are factory owners and that many government officials also have a financial interest in an industry that is responsible for 80 per cent of the country's exports. Dhaka clearly needs to put its own house in order and start by revamping the factory inspection regime. Human Rights Watch reported last year that there were just 18 government inspectors to keep tabs on more than 100,000 Dhaka factories. SubScribe has written two articles on this subject in the past couple of weeks (you can bet there will be more). The first concerned the circumstances of the disaster, workers' conditions and the predicament shoppers find themselves in when trying to buy ethically. You can read it by clicking here. I know that the little red sewing machine idea seems simplistic. I know that setting up a regulatory authority can be complicated. I know that it's hard to be certain that every element in the supply chain is squeaky clean. But does that mean it's not worth trying? It was encouraging to find support for the little red sewing machine from the likes of Livia Firth and Luella Bartley, and if more big names in the fashion world were to join the campaign, we could make it fly. The second post fleshed out the little red sewing machine idea and you can read it here. There is an argument that such labelling wouldn't have prevented the tragedy last month because it would concern only working conditions and sourcing, and not the structure of the building. ABF has not (as I write) signed up to a code of safety for buildings in spite of a petition signed by tens of thousands urging it to do so. The company says it is pursuing its own course of action. But if it wants customer support, it needs to be open and frank about its approach. One know-nothing woman tapping away at a laptop can't save the world, but there are others out there who are thinking along similar lines. The pressure is growing and the issue is beginning to move out of the blogosphere and into mainstream media. Events of the past two weeks may have created a momentum that will eventually require our high street chains to look to themselves and come up with real solutions rather than excuses. There were people in the 19th century who said the world couldn't function without slaves. There were people in the 20th century who said apartheid in South Africa would never end. There were people in this century who never imagined you could have a computer the size of a paperback. Given the evidence of humankind's ability to overcome hurdles and make huge social and technical strides when the will is there, how can we say today that there will never be a fully ethical fashion supply chain? 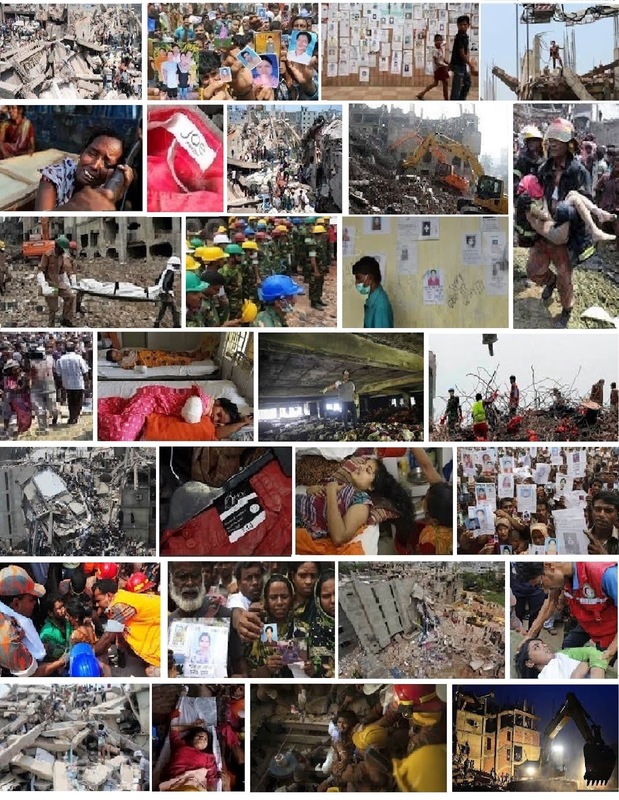 If you need convincing of the importance of this issue, look at the collection of pictures below taken since the disaster on April 24, and read this report from the Independent Europe Daily Express of a surviving factory worker's fears for the future. Please back the campaign by spreading the word, putting forward ideas and tweeting using the hashtag #littleredsewingmachine. 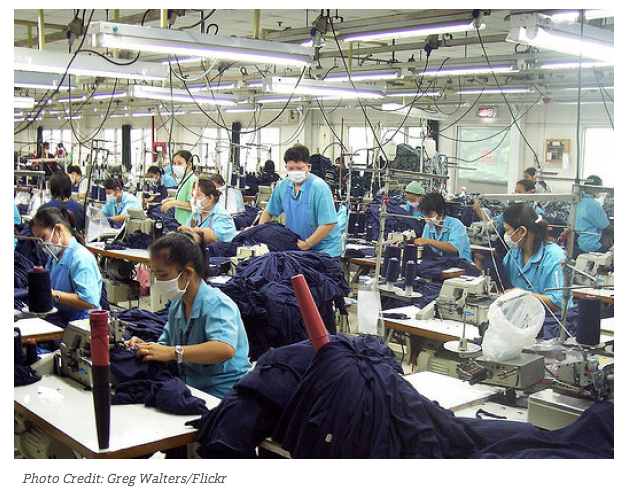 Will safety accord help us to find ethical clothing? Three weeks ago 1,127 people were killed when an eight-storey factory block collapsed in a Dhaka suburb. 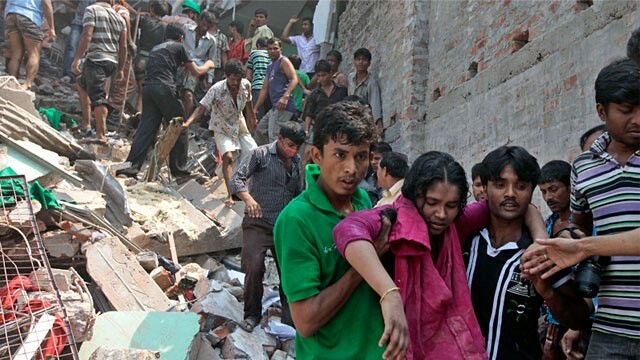 The victims were largely garment trade workers, most of them making clothes for the Western market. This week 31 big-name Western clothing chains endorsed a fire and safety accord designed to ensure that such a tragedy never happens again. Between them, these chains buy from more than a thousand factories in Bangladesh. Campaigners were delighted with their haul and declared it a watershed, the dawn of a new era. Wow, that was quick! You wouldn't have thought it possible. Well, it's without doubt an achievement, but it wasn't quite that quick and it is sadly unlikely to be a cure-all. The idea for the accord grew not from the Rana Plaza disaster last month, but from a series of fatal fires culminating in one that killed more than a hundred workers at the Tazreen factory in the city last November. 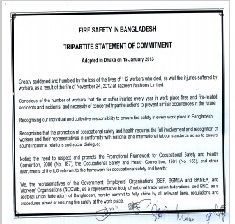 In January this year, the Dhaka Government, garment manufacturers and workers' organisations signed a statement of commitment to come up with an action plan to improve fire safety at work across the country. A committee was formed and its recommended strategy was approved by the Government at the end of March. That basically called on ministers, employers and workers to recognise and fulfil their responsibilities and for outside organisations - such as brands and international development agencies - to be encouraged to join the party. PHV, which is behind Calvin Klein and Tommy Hilfiger, and the German company Tchibo signed up straight away. The latest tragedy gave the campaign for action added impetus, and a deadline of midnight on Wednesday was set for retailers to sign up. The fact hat so many household names did so in the final 48 hours suggests that a tipping point may have been reached and that their customers are demanding action and more information about the clothes they buy. The accord aims to establish a new inspection regime that places a burden of responsibility on the retailer as well as on the factories and the Government. The stores will be expected to put up to $500,000 a year into the project and to contribute towards remedial work needed to bring factories up to standard. If manufacturers fail to meet the required standards, the retailer will have to stop doing business with them. The agreement also aims to give workers more muscle. They should be trained in fire safety practices and be allowed to decline, without penalty, to work in a building if they fear that it is unsafe. Health and safety committees should be set up at factories and workers should make up half the representatives. So far, so good. Even better is the fact that implementation is intended to start immediately and that it should be well on the road by the end of next month. A steering committee is to be set up to get things moving, with its major task the appointment of an independent safety inspector 'with fire and building safety expertise and impeccable credentials'. Workers and the exporters will have equal representation on the steering committee, whose chairman will come from the International Labour Organisation. The factory bosses are excluded from this area, although they will have seats on the advisory board that will discuss strategy and, with luck, build stronger relations between the various interested parties, and on the committee that actually runs the show. The Government has meanwhile promised new laws. The minimum wage is to be raised - at £25 per month, Bangladeshi clothing factory workers are the lowest paid in the world - and the ban on the unionisation of factories is to be loosened. It has also said that it will train 200 more safety inspectors by the end of the year - at the moment there are only 50 to cover 200,000 factories (or 18 to cover 100,000, depending on whose figures you use). These measures have been promised by the end of the month. There are still many hurdles to be overcome, however. 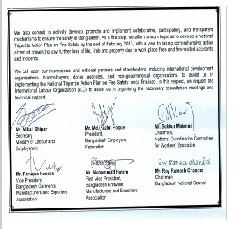 Many of these factories are in Export Processing Zones from which trade unions are banned. If the Government produces its promised legislation (which is by no means a given) workers will be able to form unions and enter into collective bargaining. Yet it will still not be illegal for employers to fire employees trying to organise workers. How is that going to work? Who is to determine whether people have got together in a reasonable manner or whether they have been suborned by a rabid firebrand? And always at the back of people's minds will be the torture and murder last year of Aminul Islam, a local president of the garment workers' federation. His killer has not been brought to justice. We are a long way from happy families here. Factory owners have a huge influence on the Government - both inside and outside of parliament. About half of the country's MPs have business links and a tenth of them are clothing factory owners. They are hostile to the trade unions and will not like the central role they are being given in establishing the new regime. Nor are they too happy with their customers, the big-name buyers from the West who have been pushing them on prices. Costs have risen over recent years, even before the promised reforms, but prices have been kept low. 'The buyers have not given anything. They just say "increase your productivity",' one owner told Reuters. The unions and anti-sweatshop campaigners such as War on Want and Labour Behind the Label are understandably impatient for change. But there is an aggressive tone amid the celebrations over getting so many big names to sign the accord. The main targets for their venom are Walmart and Gap, both of which have declined to sign up. Gap said it was ready to sign but was concerned about the potential ramifications from the fact that the accord is legally binding. It fears - probably quite reasonably, as the New York Times pointed out - the potential cost should any dispute end up in an American court. Walmart, which owns Asda, said it had already acted with its own inspection regime. This includes thermal circuit imaging to check electrical systems, and it has said that it will publish a list of its approved factories and their inspection results. It has also promised fire safety training for every worker but has yet to commit any money towards carrying out factory improvements found necessary. Such explanations, or excuses, cut no ice with campaigners. Paul Jennings, general secretary of UNI Global Union, said: 'Walmart, the world's largest retailer, is out of step. By not signing up, the Walmart brand sinks to a new low.' 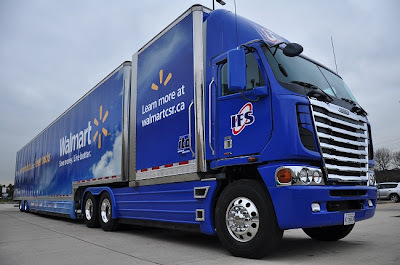 Tim Noonan of the International Trade Union Federation, accused Walmart of sticking with a system that had failed 'year after year...corporate-sponsored investigations that aren't investigations'. Murray Worthy, a War on Want campaigner told the Independent that Gap's position was absolutely outrageous and that its objection was a smokescreen that would rip the heart out of the agreement. 'It's a straightforward statement that they don't care at all about the safety of their workers and aren't interested in taking action to put that right.' The Labour MP John McDonnell said people should boycott the shop and that British customers had a duty to force it into action. Are such complaints justified? Bloomberg Business Week notes that JC Penney had also remained aloof, commenting: These companies are concerned about preventing the fires and collapses...but signing a legally binding agreement with built-in systems to resolve disputes that was created with labour unions? That’s too European." When a fire engulfed the Tazreen Fashions garment factory in late November, Sumi Abedin was resigned to die. Defying orders from floor bosses to stay at her sewing machine after word got around that a blaze was spreading down below, she and her co-workers ran to the two "women's" exits, only to find them padlocked. Another "male" stairwell was choked with smoke and bodies, forcing her to retreat by the light of a cell phone. Amid the screams and confusion, a ventilation shaft offered a way out: a three-story fall to the ground, one that could also be fatal. "I did not jump to save my life; I jumped to save my body," says the 24-year-old, hoping her family could identify her remains. Will she be able to sway Walmart, which buys from 279 factories in Bangladesh and is the industry's second-biggest customer, spending $1bn a year in the country? Shortly before the deadline for signing the safety accord on Wednesday, the company broke off relations with a supplier because documents in the wreckage of Rana Plaza included an order dated May 2012 for more than 5,000 pairs of skinny jeans that were destined for its shops. Walmart had said after the disaster that it had no dealings with factories in the building. The timing of the announcement and the detailed explanations are interesting. Walmart's supplier was the Canadian company Fame Jeans, which had apparently given an assurance that it had not dealt with Rana Plaza. Walmart said: "Based upon our policy on unauthorised sub-contracting we are terminating this supplier." Fame Jeans immediately put up its hands, with Alen Brandman the chief executive, saying: "It's very clear that Walmart did not authorise me in any capacity to work within this factory." A rogue employee had placed the order without the knowledge of senior managers. Ah, those rogue employees. You just can't trust them. Funnily enough, Walmart had severed links with another supplier after the Tazreen fire. Funnily enough documents surfaced showing that a supplier had been buying clothes from that factory. "A supplier subcontracted work to this factory without authorisation and in direct violation of our policies," the company said. Scott Nova of the Workers Rights Consortium, which monitors workers' rights in factories that produce goods for sale in the US, was unimpressed by the coincidence: "One disaster after another at factories producing Walmart goods, but it's never Walmart's fault. They always have some story about a rogue supplier or sneaky subcontractor." Other order dockets found in the Rana Plaza wreckage showed that the Spanish Mango chain and the Danish group PWT had both had dealings with the Phantom Tac factory based in the building. One order was for 12,000 polo shirts and another for long-sleeve checked shirts. Mango was to pay $4.45 each for the polo shirts, which it would sell in its British shops for £26 - £30. The checked shirts would cost PWT $5.08 each and be marketed under the Jack's label at 25 euros. Mango said it had requested samples and the order would not have been confirmed until the factory had undergone a successful social audit. Retailers have been criticised for their big profit margins, so it is interesting to look at these a little more. Inditex, which owns Zara, operates on a gross margin of 58% - the bald relationship between the cost of the goods and the price for which they are sold. But when other costs - premises, staffing, taxes, shipping etc - are taken into account, this comes down to 16%. H&M's margins are 55% and 9%. Activists say that the published figures show that they could afford to pay more to see workers' conditions improve without a big increase in the prices in their shops. The TUC was quoted in The Times on Saturday as saying that doubling Bangladeshi workers' pay would add only 2p to the cost of a T-shirt. The BBC has also looked at margins, taking as its example a pair of $50 jeans for sale in Germany. Breaking down where the money goes, Philip Hampsheir says that 39% ($19.50) goes to the retailer, 16% ($8) in tax, 9% ($4.50) on shipping and 20% ($10) on the denim, buttons, zips etc. That leaves 16% ($8) to go to the producer, who has to pay his rent, fuel and equipment bills and taxes as well as his workers before taking his share. The BBC puts the cost of manufacture at $6 and the profit at $2. Some will take this as proof of how Western retailers are squeezing their suppliers, others will question the way that final $8 is split. Is any of this helpful for the shopper who merely wants to know whether their jeans or T shirt have been made in a sweatshop? Probably not. And so we come back to the Little Red Sewing Machine and the need for a reliable guide to whether workers are properly paid and decently treated. Remember, the accord that brought whoops of joy this week relate only to safety. That is obviously vital to avoid another tragedy, but even if the accord brings real change - a big if - we are still a long way from making sure that women are not chained to their sewing machines for 12 hours at a time for a pittance. And remember, this accord applies only to Bangladesh. Three people died and dozens were injured or trapped when a factory roof collapsed in Cambodia on Thursday. It was making trainers for the Western market. We want to look good. We want to be able to ring the changes. We want to dress on a budget. Where do we shop? Primark? Matalan? Asda? We have a little more money. We want to look stylish. Where do we shop? Zara? Gap? We like sport - or to look sporty. The bank of Mum and Dad is willing to fork out. Where do we shop? Nike? Reebok? We want to make sure that our clothes are ethically produced. Where do we shop? None of the above? It's easy to point the finger at Western brands and assume they are all cavalier about the safety of the workers who produce their clothes and shoes. Many take it for granted that if it's cheap it's probably been made in a sweatshop, if it costs a pretty penny then it's more likely to have been ethically sourced. Not so. Price is no guide to the quality of life enjoyed (or suffered) by the girls at the sewing machines. Do we look to see if they have signed up to the fire and safety accord drawn up to try to prevent a repeat of the blaze that killed more than a thousand people at the Rana Plaza factory complex in Dhaka in April? Well it may be a start, but that accord applies only to Bangladesh. And some of those who didn't sign had their own arrangements in place. So how are customers supposed to make their decisions? After the Rana Plaza disaster SubSist suggested the introduction of a little red sewing machine symbol to indicate that workers' conditions met a certain agreed level. Not being an expert, SubSist could not suggest what the criteria should be, but hoped campaigners, the importers and exporters could come up with a benchmark. How naive. The idea was popular, but there were too many complications. Too many inspection regimes, too many different campaigns, too many countries with different issues. It would be nice to think that it is still a viable notion in the longterm, but in the meantime, let's look at what's going on in the Far East. Bangladesh is seen by many as the top priority, largely because of the Rana Plaza tragedy and the failure of Western companies to come through with proper compensation for the survivors and families of the dead. Another fatal fire this week reinforces that idea. 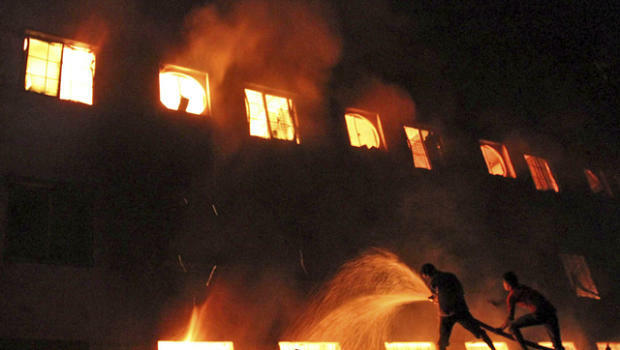 Seven were killed in the blaze at a knitting factory on the outskirts of Dhaka, which fortunately started after most of the 3,000 workers had gone home. The fire has been blamed by some on a faulty knitting machine that had caught fire more than once before. Gap, Next, H&M and Carrefour were said to be customers - although H&M and Gap both said they had dealings with the factory's parent company, but that they had not placed orders with the plant that caught fire. See the problem? Quite apart from responsibility for safety at the site, is the owner - the giant Palmal Industries - at fault for passing orders down the line without informing the customer or is the brand at fault for failing to check all the way down the supply chain? Bangladesh has an enormous clothing manufacturing industry. It has 100,000 factories around Dhaka and their efforts account for 80% of the country's exports. It also has the lowest wages. The Government (which inevitably includes factory owners, given the size of the sector) has agreed to lift a law banning unions from clothing factories. But while that's an advance, it's no panacea. 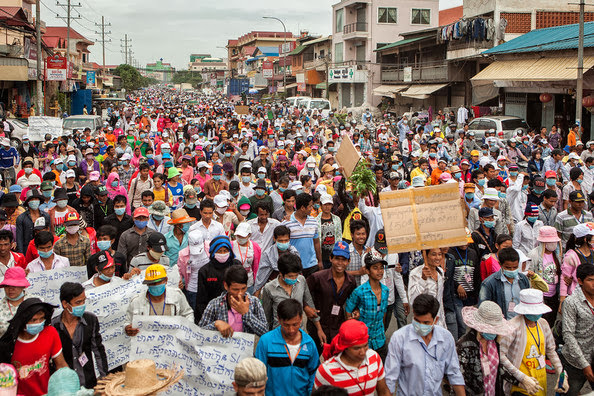 In Cambodia, workers at the Singapore-owned SL factory have been on strike since August in a fight for higher wages and a food allowance. There have been riots, fires, and military police have been standing guard at factories. It is not a happy scene. The strikes have twice been declared illegal and the unions are afraid that SL will shut down the plant, reopen under another name and then make sure that the activists are debarred when rehiring workers. The owners say everything was hunky dory for a decade before the unions moved into the plant. Well, that's a matter of opinion. Cambodian factories seem to be prone to a strange phenomenon known as 'mass fainting'. The union says this has been an issue since the early 90s. Hundreds of workers have been known to faint at the same time in some factories. What? Why? A report called Shop 'Til They Drop published jointly last month by the Community Legal Education Center and Labour Behind the Label found that a third of the 95 workers they met were malnourished and a quarter of them were dangerously emaciated. We don't know how the sample was chosen, so it is possible that the most vulnerable were put forward. The report concluded that low wages were at the root of it - the workers had little money and little time, since they were working long hours of (often compulsory) overtime. Ah, mobile phones. We'll come back to them in a bit. If a worker is paid $80 for a 40-hour week, how long must he or she work to earn $150? According to a report by Worker Rights Consortium, Cambodian workers' wages have declined by 22 per cent in real terms between 2001 and 2011, compared with a 2% fall in Bangladesh. Over the same period wages in China doubled, those in Vietnam went up by 28% and those in India rose by 39% - all in real terms. Loo's organisation has an explanation: the need to maintain a 'competitive edge'. It is, after all, by far the country's biggest export sector and hundreds of thousands of people therefore depend on it. As with Bangladesh, the clothing factories account for 80% of exports. The World Economic Forum estimates that the trade was worth $4.5bn last year and reports that five new factories are opening every month. If the strikes and the fainting and the rivalry with Bangladesh weren't enough to contend with, a UN-backed organisation is stirring the mix. The International Labour Organisation's Better Factories Cambodia announced last month that from January it would be publishing online information on how factories fare in meeting safety and welfare standards on 21 different measures. Better Factories has been conducting unannounced inspections since 2001 and its findings were published in line with a trading agreement between America and Cambodia. Once that pact came to an end, so do the publication of inspection results. The announcement of the 'name and shame' policy three weeks ago enraged the garment manufacturers - who declared that it would drive business out of the country to cheaper rivals such as Bangladesh. They also said that if Better Factories inspectors turned up they would be accompanied round the plants by government officials. But all the time the factory owners insisted that they were all for greater transparency on working conditions. So the ILO group are the goodies here? Well, not in everyone's eyes. Critics point to the dramatic decline in wages under its watch. And the rather complacent video above doesn't exactly inspire confidence. The SL workers' fears that their factory could be closed peremptorily may seem melodramatic to people in stable employment in the West, but ethical sourcing campaigners will hardly need reminding about the 2,800 PT Kizone factory workers in Indonesia, who were thrown out of their jobs without pay at the beginning of 2011. The factory made quality college and sportswear which sold all over the world, particularly in America. But the workers were not paid in December 2010 and then the factory owner disappeared. Buying agents called Green Textile took over the plant in February and signed agreements with the local union to pay some of the money owed. Kizone was declared bankrupt in April and the factory closed. In July, Nike offered just over $500,000 to the workers and in November Dallas Cowboys also agreed to put up some money so that, including the Green Textile funds, a pot of $1.6m was available to the workers. Sounds a lot - but it came down to $21 per worker. The following March a bankruptcy judge awarded the workers around $500,00 - but that was immediately contested by other creditors and was mired in Supreme Court litigation. In April, a year after the factory closed, the union wrote to Adidas to ask it to fulfil the obligations of its contract with Kizone and pay the workers the remaining $1.8m severance they are owed. Further letters followed without result and in June, campaigners in Europe and Indonesia organised protest days to coincide with the Euro 2012 football championship. The company (which sold 900,000 shirts during the competition) responded immediately with a spectacular own goal, offering the workers food vouchers - a gesture rejected as an insult. The workers were particularly affronted because they said they were seeking only a fraction of the money Adidas was investing as a prime sponsor of the London Olympics. Just before the Games opened, the company's chief executive Herbert Hainer told Margareta Pagano of the Independent that it had spent £100m on sponsorship, advertising and marketing for the event. The Gamesmakers were all clad in Adidas and it was the only sportswear brand allowed to have its logo on its merchandise. "It's completely false. It's a lie. We pay double the local rate for our workers – and we have assembly and manufacturing in many, many countries around the world where we work with non-governmental organisations on meeting the local rates and conditions." 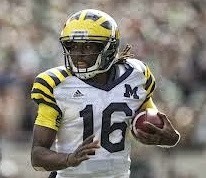 He also said that Adidas had twice offered to talk to War on Want, but had received no response. War on Want did, however, have a public response for the company with a giant projection near the Park once the Games were under way. In September American universities started to put the heat on Adidas and Cornell broke off its contract with the company. Over the following months, 17 colleges followed suit. Once again the company offered food rather than money, and was once again rebuffed. International weeks of action, Facebook protests and a disrupted fashion show added to the pressure and in April - two years after the Kizone factory closed - Adidas finally agreed a confidential deal to give the workers their severance pay. The battle to get Adidas to pay up was detailed this week in an annual review from the Clean Clothes Campaign. 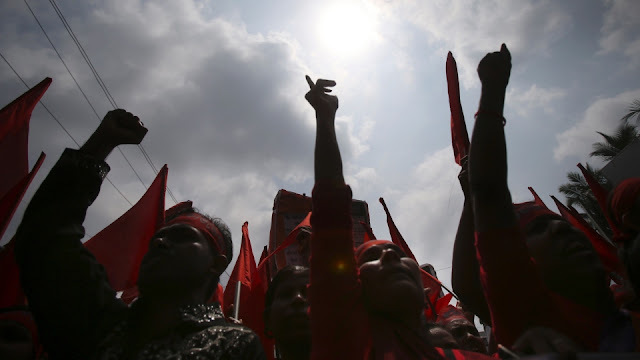 There have been other successes, but it still points up continuing struggles against extortion, intimidation and dangerous working conditions in Indonesia, Turkey, Bangladesh, China, Pakistan and Sri Lanka. There are also still worries about the use of child labour, particularly in India. They may not be in the factories - but the children who spend their days sewing at home aren't doing it for fun. And then there is the prospect of a new kid on the block. With the end of trade sanctions and the release of Aung San Suu Kyi, Burma is looking for a way to escape from poverty - and garment manufacture is seen as the ideal route. There is an abundance of labour, the work requires minimal skills - 'Workers just need eyes and hands that work, that's all,' one factory owner told the Cambodia Daily. It looks like another tragedy waiting to happen. An American expert who was taken on a tour of factories by the country's garment manufacturers association noted underage apprentices, dangerous machinery, inadequate lighting and excessive overtime. 'There's not a single factory I saw that would pass compliance.' Oh dear. How do we, the concerned consumers, work our way through this maze? One way is to look at what our shops are doing. M&S is using mobile phone technology to get first-hand reports from more than 20,000 workers in India, Sri Lanka and Bangladesh. Factory owners are kept informed, but the workers give their opinions anonymously. And the use of phones means those who can't read or write are not denied a voice. It's a start. All of which seems to suggest that it's impossible to dress ethically. 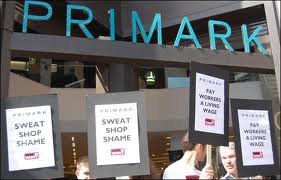 If we boycott Primark et al, then people who depend on the company for their meagre incomes will see their living standards deteriorate further. The manufacturers argue that the Western shops will not pay more and that they screw the factories down to the lowest margins. But if the shops did pay more - and, naturally, pass the extra expense to us - would that extra money find its way into the workers' pockets or merely increase the factory owners' profits? 1: Where possible, buy from shops that have been able to track the whole supply chain and can guarantee working conditions. 2: If travelling, try to buy from the individuals who make the goods you want rather than from markets or stores. 3: Shed the guilt about buying from chain stores. Just limit what you buy. Don't get suckered into going for a 'bargain' that you don't really need. 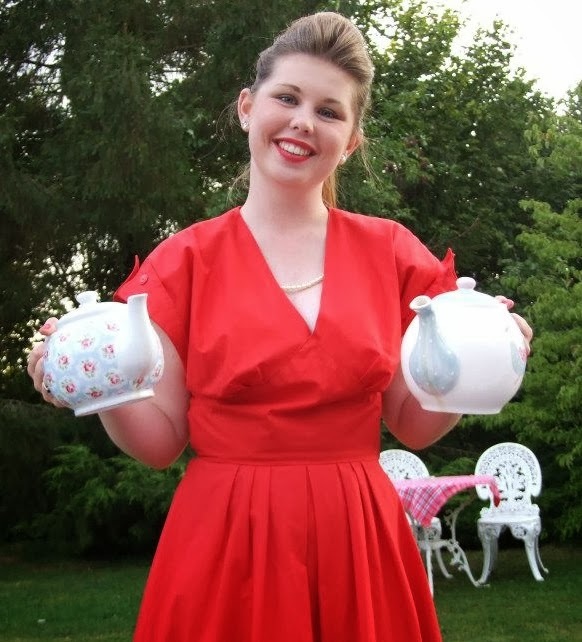 4: Don't be too proud to buy from charity shops, boot sales, ebay. But choose topnotch labels that you can trust, not an even cheaper Matalan T-shirt. 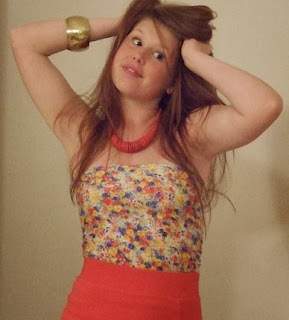 5: Create your own style. Rootle around in the attic. Go to retro shops and vintage fairs. Mix and match a quality piece bought second hand with that cheap shirt or vest. 6: Get to grips with the sewing machine and make your own clothes. 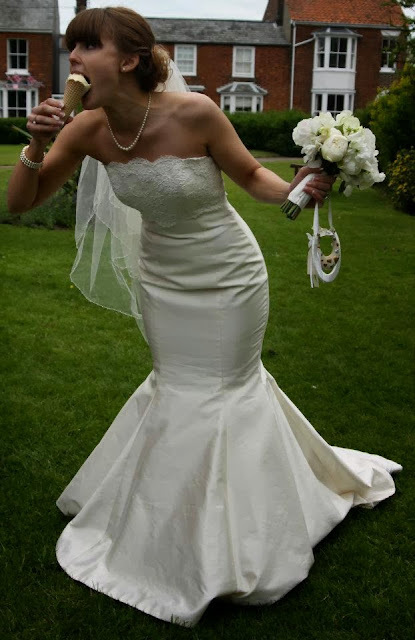 And even on the biggest day of your life, you can still look stunning in a vintage number picked up from a charity shop and altered just for you. Good luck. i am an artist working on a collaborative project in relation to the Rana Plaza disaster. we (myself, another artist and a group from the Asian woman's network are stitching layers of fabric scraps in to squares to create a large hanging. Each square will represent a person who lost their life in the disaster. we would love to include the image of the Little Red Sewing Machine and/or any other logo from textile fair trade to raise awareness of the consumers impact on people living in countries where these garments are made.